R&S services a wide range of telephone entry systems and over the years we have come to know which products are consistently reliable and give you the greatest return for your dollar. You can be assured that these systems will give you years of reliable service. The model 1812 is a unique telephone intercom system that allows homeowners to use their telephone as an intercom to speak to a guest at a front door or gate without the necessity to pay for an additional telephone line at their home. With its “intercom mode” programming feature, the 1812 can also be connected to a PBX or KSU type system, making it ideal for small businesses to control access through a single door or gate. Visitors are easily identified by voice communication and can be granted or denied access directly from a touch-tone telephone. The 1812 is available in both surface and flush mount designs and includes the DKS auto-programming software for Windows, allowing homeowners to program the system right from their home computer. “Do Not Disturb” time zone. Connects in series with the residential phone line. By-pass switch provided. Surface mount dimensions: 6.25″H x 10″W x 5.25″D. Flush mount dimensions: 9.25″H x 12″W x 4.0″D. Surface, flush or wall mount – specify which. Gold plated faceplate – Flush or surface mount units only. The Model 1835 is an ideal telephone entry system suited for apartment and gated community applications as well as office buildings and industrial sites that have a separate access control system, or require telephone entry only. The single-line LCD display features big 1/2-inch characters for easy viewing and your personalized message scrolls across the screen from right to left when the system is not in use. Our unique “One Touch” CALL button makes this system one of the easiest to use on the market today! The built-in electronic directory, easy to use Remote Account Manager programming software, card reader interface and expandability options make this unit an ideal choice for those applications with a large number of system users and entry locations. Up to 16 card readers can be interfaced with the 1835 to provide access control. Additionally, our elevator control module restricts which floors a guest or system users have access to, making it an ideal system for high rise buildings. For additional security, the 1835 allows you to monitor activity AS IT HAPPENS on your computer display (requires RS-232 connection), and with our anti-pass back memory option, you can enable a TRUE anti-pass back system in one of three different configurations; passive, active and trap. The 1835 is available in three distinct styles: Surface mount, Flush mount and Wall mount. PC Programmable via modem or RS-232. Remote Account Manager and Transaction Analysis software included. Anti-pass back capable (requires AP chip option). Stores up to 3000 telephone numbers and names. Memory sizes available: 25, 75, 125, 250, 500, 1000, 2000, 3000. Stores up to 8000 access card codes – dependent on system memory. Elevator control (note 2) for up to 4 elevators, each serving 64 floors. Expandable (note 3) to control up to 16 entry points. 3 form “C” dry contact relays. Dimensions Surface Mount: 13″H x 11.25″W x 4.75″D. Dimensions Flush Mount: 13.5″H x 12″W x 2.5″D. Dimensions Wall Mount: 15″H x 13.25″W x 3.5″D. Note 1: Requires APB memory option. Note 2: Requires Elevator Control Board(s). Note 3: Requires Tracker Expansion Board(s). Surface, flush or wall mount. Memory size: 25, 75, 125, 250, 500, 1000, 2000, 3000. Memory type: standard or anti-pass back. Surface mount trim ring (use with surface mount units only). The Model 1837 is an ideal telephone entry and access control system suited for medium to large apartment and gated community applications as well as office buildings and industrial sites. The eight-line LCD display features big 1/2-inch characters for easy viewing and your personalized message appears on the screen when the system is not in use. Our unique “One Touch” CALL button makes this system one of the easiest to use on the market today! The built-in electronic directory, easy to use Remote Account Manager programming software, card reader interface and expandability options make this unit an ideal choice for those applications with a large number of system users and entry locations. Up to 16 card readers can be interfaced with the 1837 to provide access control. Additionally, our elevator control module restricts which floors a guest or system users have access to, making it an ideal system for high rise buildings. For additional security, the 1837 allows you to monitor activity AS IT HAPPENS on your computer display (requires RS-232 connection), and with our anti-pass back memory option, you can enable a TRUE anti-pass back system in one of three different configurations; passive, active and trap. The 1837 is available in three distinct styles: Surface mount, Flush mount and Wall mount. R&S also services and installs Telephone Entry systems by Linear. 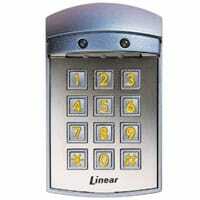 Linear is one of the leading manufacturer’s of access control systems. Door or gate access using four digit entry codes. Model 1503 low cost, will store (2) four digit codes. Model 1504 can add a speaker and push button for intercom. 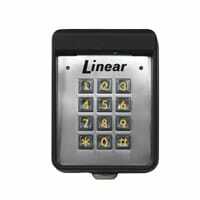 Model 1506 can store up to 1000 codes, a slave keypad may be added, allows control to two separate access points. High security remote transmitter gate control. Model 8057 can store up to 16,000 individual transmitter codes. Ideal stand alone. Model 8059 provides format to interface with an access control system.